Gifting can be stressful, so my hope is that these help give you vision for your 2018 holiday gifting. I’ll be releasing 1 a day for the next few days, so let’s get started on Day 1! Filson Short Lined Cruiser Jacket // $350.00. If you have a bit of wiggle room to splurge for your guy, this Filson jacket is fantastic. They create such quality products that last forever, and they are just so classy. This is a personal favorite of mine. If you can’t spend this much on a jacket, like many of us, check out Goodfellow & Co. at Target to get the look for less. I really love this Goodfellow & Co. Sweater Fleece Shirt Jacket at Target for $27.99. I am also loving this Goodfellow & Co. Military Jacket at Target right now for $79.99. For example (on splurging + saving), for Joel’s graduation from Colorado State University in 2016, I gifted him with a similar Filson jacket to this one. For Christmas this past year, I gifted him with a forrest green Goodfellow & Co. jacket from Target, and we have been so pleased with the quality of both. The Ridge Wallet // $72.00. My husband actually recommended this when I was talking to him about my Gift Guides. This wallet is sleek, has great reviews - literally hundreds of them, and has some cool features, like RFID-Blocking Aluminum Plates, and a Lifetime Guarantee. They have some other pretty cool products as well, so if your guy isn’t in need of a wallet, check out some of their other offerings. Apple AirPods // $159.00. If your guy is techy but wouldn’t necessarily purchase a nice product like this on his own, surprise him with a nice, long-lasting product like these Apple AirPods. Good headphones are hard to come by. I literally just use the freebies that come with the iPhone, so yes I’ve had my headphones since 2014, but if you’re big on music or audiobooks or podcasting, these are money. Goal Zero Flip 20 Power Bank // $29.95. If your guy is techy, and you’re on a budget, give one of these a shot: a power bank. I have really grown to love a functional gift. We were gifted one of these recently, and we LOVE it. It’s small, easy to transport, and fantastic because it takes away phone-battery-dying-anxiety on travel days, game days, or just really-long-time-away-from-your-house days. It’s great for the ‘big gift’ in a stocking as well. Select colors are on Sale for $19.95 as well! Muir Way Maps // From $59.00. I am a sucker for “local” items, i.e. decor specific to a city - pillows, wall decor, beer glasses. Yup, I’m that girl. The topographic map in the photo above is of New Orleans, LA in 1954. I love these as a gift, because they are unique and can be such a special momento, while still being pretty in your home. There are several to choose from, and they also have paper and framing options (although I always go the Target and/or Hobby Lobby route for framing). Is there a place special to your guy? Or to you two as a couple? Check these out. The History of Fly Fishing in 50 Flies Coffee Table Book // $22.50. I am big on coffee table books. I love them! But ONLY if they are relative. We picked this book up while in Nashville recently, and it fits well in our home. Think about a topic that interests your guy, and do some searching, or message me, and I’ll do the searching for you! Books are a great, affordable gift that can also serve as home decor. But remember: make it relative. Ain’t nobody got time or room in their home for random coffee table books. The retail on this book in $22.50, but the link above will take you to Amazon where it’s $17.34! Myles Everyday Shorts // $58.00. These shorts are everything. Joel has 4 colors and has gotten several of his friends on board too. High quality, reasonable price-point, frequent sales/specials. We love them and have been super impressed by Myles. Whiskey Peaks Rocks Glasses // $65.00 for a Set of 4. I love these glasses as a twist on your classic whiskey glass. Huckberry (the site that sells these) is super hip and has some really cool gifts for men, so make sure you cruise around the site. Also, they have a pretty great catalog, so sign up for their newsletter/catalogue, cause it’s fun for your guy when it comes in the mail! These glasses each have a topographic map in the bottom of a well-known peak around the world. I mean how fun?! Patagonia Fjord Flannel // $89.00. There’s not much better than gifting your guy with a Patagonia flannel. I love these classic flannels, and they go the distance. But you know what? As awesome as it is, we’re in a stage in life where a Patagonia flannel isn’t the best option. If it is, oh my goodness snag one of these. They are the best. If you aren’t, I kid you not, CostCo has THE best flannels, for like, $15.00 or less. Also, check out Goodfellow & Co. again at Target for ‘the look for less’ options, like this flannel for $27.99 . If you can splurge, splurge! If you can’t, I can speak from experience that CostCo flannels (<<this one) get just as many, if not more, compliments and “where did you get that?? ?” comments. Bombas Tri-Block Calf Socks // $48.00 for a 4-Pack. I know what you’re thinking - 48 bucks for 4 pairs of socks?!?!?! Yes, I am you. I buy 40 pairs or socks for $10 on Amazon, but hear me out. Joel recently ordered these and has been so impressed. And guess what? How many times do you actually purchase new socks? This was his selling point, and I was sold. For every pair purchased, a pair is donated. They are great and are a unique twist on just ‘socks.’ Throw these in with another gift as a filler, or let them stand alone. I have a feeling you won’t be disappointed! 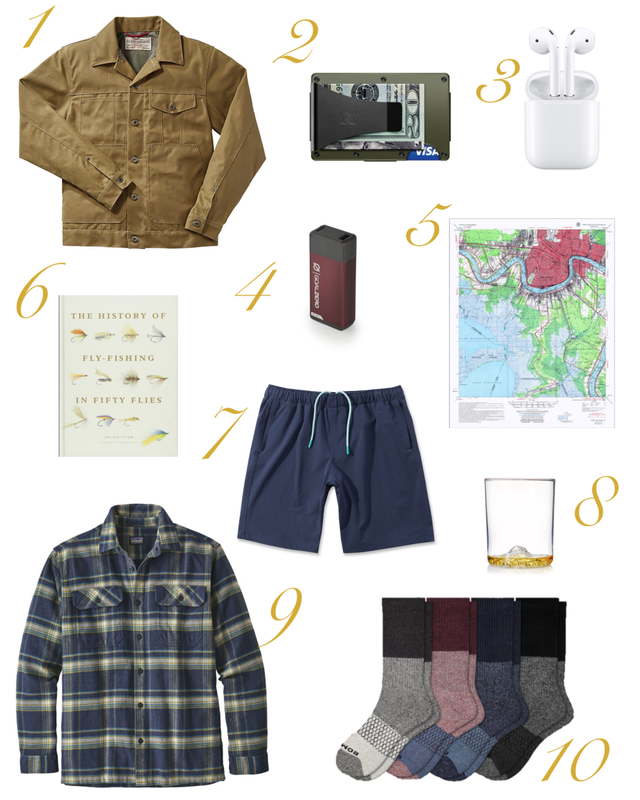 What are your go-to gifts for guys? Listen-in on what they might like or be interested in. It’s tough to buy (especially on a budget! ), so I would love to hear y’all’s feedback. I will see you back here tomorrow for Day 2 of the 5 Days of Gift Guides!